Ani Cordero Pays Tribute To The History Of Latin Protest Music A founder of the Latin rock band Pistolera, Cordero uses her new solo album, Recordar, to shed light on a time in Latin American history when important voices were silenced. 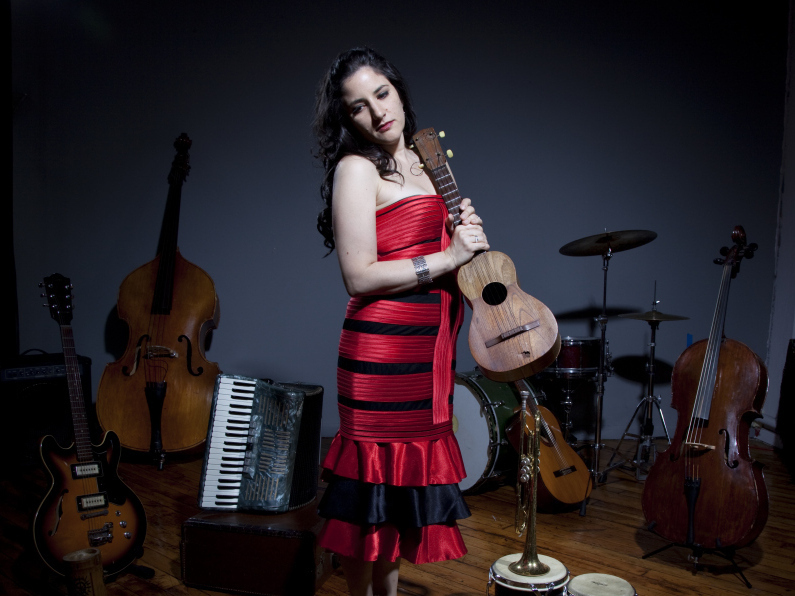 Ani Cordero's new album is Recordar: Latin American Songs Of Love And Protest. New York's Ani Cordero was one of the founding members of the Latin rock band Pistolera. On her new solo album, she's unplugged — but no less powerful. Recordar is a kind of tribute album: a tribute to voices of dissent. The songs are her takes on some of Latin America's classic protest anthems. "They represent a period in Latin American and Caribbean history when the political climate was a bit difficult," she says. Cordero became interested in this music while she was taking a college course taught by Dr. Juan Allende — "who happened to be the nephew of Chilean president Salvador Allende, who was overthrown by Pinochet," she notes. That's how she learned about one of Allende's supporters: singer-songwriter and activist Victor Jara. Jara was an ally of Allende, but once Augusto Pinochet took over, Jara's outspoken support for the former socialist government made him a threat. He was hunted down, captured and tortured. "They took him to a stadium and killed him rather violently," Cordero says. "And that stadium now bears his name." Recordar begins with Cordero's version of Jara's song "Deja La Vida Volar." "The words are about being in the moment and letting fear escape for a while, and being in love despite the fear," she says. "In the end, it's saying that you might experience darkness, but the sun will return." Even out of context, "Deja La Vida Volar" is a beautiful, haunting love song. But it has a different feeling, Cordero says, when you know the political situation in Chile and what happened to Jara: "It's very intense. It's one of the most direct and horrifying stories of retribution against musicians for being part of a political cause." The full title of Cordero's album is Recordar: Latin American Songs Of Love and Protest, and on it the personal and political are presented as inextricable. Take the song "Macorina," originally by Mexico's Chavela Vargas, which at face value reads as a simple love song. "She came out as a lesbian when she was 80. I don't think anybody was totally shocked. But still, in the time that she was singing 'Macorina,' it wasn't really acceptable in Mexico or Latin America to be gay," Cordero explains. "And so to sing this passionate love song about your female lover as a woman, I think, is incredibly brave. It's ultimately just a very sweet song as well — a little bit sad because, at the end, her lover leaves so nobody will know." Recordar's songs are reminiscent of those from the Civil Rights era in the United States. While they're born out of struggle and suffering, there's joy and beauty at the same time. "I think that's one of the roles of music making," Cordero says: "to find a way to make beauty out of difficult situations."